Arkells fans were recently treated to the surprise new single "Knocking at the Door," and now the raucous tune has been matched up with a music video. The song has been blasting through sports bars everywhere as part of a recent Toronto Blue Jays-themed Budweiser commercial, but now you can check out the band's own original visuals for the track. 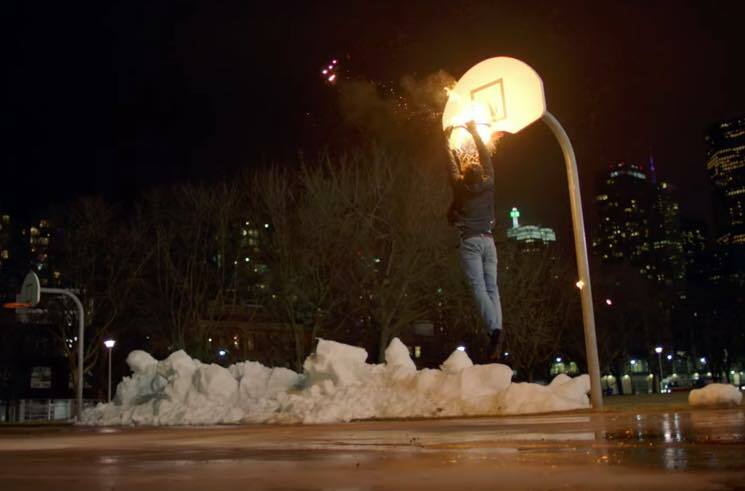 It was filmed at various locations around Toronto, and keeping in line with the sports-friendly bombast of the song, the clip captures boxing matches and sprinting runners — not to mention flaming basketballs, baseballs and skateboards. "All the old Arkells fans like it because I scream a bit, and new Arkells fans like it because it's also kinda modern and poppy," frontman Max Kerman said in a statement, explaining the appeal of the single. "We like it because it's the most adventurous and exciting thing we've done yet. Who knew we could have such a fun ride with one surprise song?" Check out the fired-up accompanying clip down below, and head over here to keep up with the band's live dates. "Knocking At The Door" will be included on the deluxe vinyl version of Arkells' 2016 album Morning Report, which you can pre-order here.